 Nancy’s Petite Stuffed Bagels: delicious (photo courtesy Is This Really Is My Life). Look for the box in the freezer section (photo Kraft Heinz). This week we have a tie for Top Pick. Both sit in the freezer until you want them. And we want more and more of them. 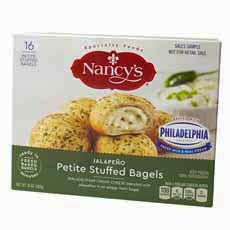 We received samples of Nancy’s Petite Stuffed Bagels right before Thanksgiving; and what a festive treat they were. The bagels are kept frozen, then heated in the oven or microwave. We found microwaving worked just fine. We enjoyed a mixed selection of them with our morning coffee or tea. But these lovely bites will make a brunch or special-occasion breakfast all the more festive. The marketing materials explain that the product was inspired by Nancy Mueller, a San Francisco hostess. But surprise: The brand is owned by The Kraft Heinz Company, which produces the NANCY’S Frozen Appetizers & Entrées line. This detail came as a surprise to us, because the product packaging and the bagels themselves seem more like a small brand labor of love than the product of a mega-manufacturer. Bravo, Kraft Heinz. We plan to keep our freezer full of these little treats. Petite Stuffed Bagels are available on nationwide at select grocers, at a suggested retail price of $6.99 for 16 bagels. Each petite bagels delivers two big bites. We have an admission: As a bagel lover who often eats a large bagel for breakfast, we are just as satisfied with one or two of Nancy’s Petite Stuffed Bagels. 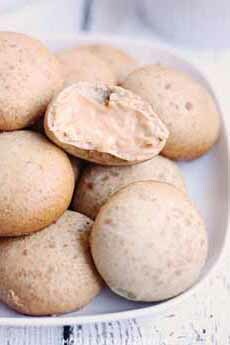 You may be familiar with Bantam Bagels, the original mini stuffed bagel. We enjoyed them for several years, fresh at their shop in Greenwich Village. But when the frozen version came out, for us it lost something in translation. We found that microwaving produced chewy dough. While we didn’t test Bantam Bagels side by side with Nancy’s, we didn’t have this problem with the latter. However: Bantam, we love your new Bantam Pancakes. They’re not flat, but rounded like the bagels to include a delicious filling. Now when you have a pancake craving, just pop one or two into the microwave. There’s a store locator on the website, or buy them online. They’re an innovative thank-you gifts for dinner, party or weekend hosts. Note to our friends and family: We’d be happy if Santa brought us a few more boxes. 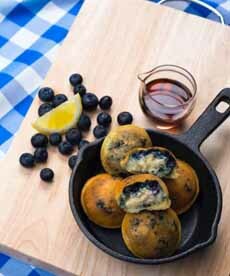 Blueberry pancake bites are winners (both photos courtesy Bantam Bagels). 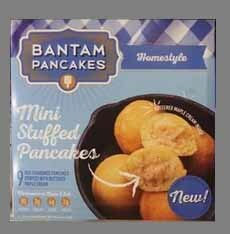 Look for Bantam Pancakes in the freezer section.